Austrailan photographer John Gollings has received a wealth of accolades in recognition of his prolific career including a Master’s degree in Architecture, an Honorary Fellowship of the Australian Institute of Architects, Adjunct Professor at the School of Media and Communications at RMIT University and he has twice received the Australian Institute of Architects Presidents Prize. In 2013 he was awarded the inaugural William J. Mitchell International Committee Prize by the Australian Institute of Architects and most recently, he was made a Member of the Order of Australia (AM) for ‘significant service to photography through the documentation of iconic architectural landmarks in Australia and the Asia Pacific region’. His work has recently been included in several exhibitions and collections around the world. 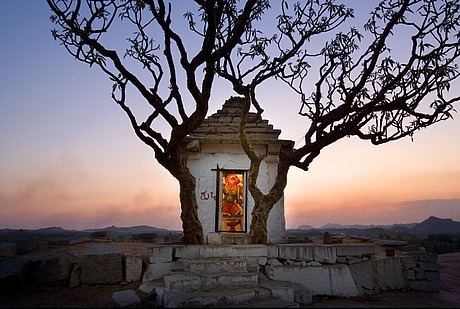 For his profile picture, John chose his image of a small temple in the City of Vijayanagara in southern India, which is the birthplace of the monkey god Hanuman: "The image sums up my whole approach to an effective architectural photo, a simple, memorable composition with context, photographed at twilight so that you see inside and outside simultaneously and preferably in elevation".